The settlement of almost all frontier towns during the U.S.’s 19th-century western expansion grew out of military forts built to protect pioneers from local indigenous peoples, but Superior, Wisconsin, was an exception. Founded in 1854 following the Second Treaty of LaPointe, Superior was a relatively safe place when first settled; the local Ojibwe had traded with the French and British for nearly 100 years and were no threat to pioneers. But after an Indian uprising in New Ulm, Minnesota nearly a decade after its establishment, Superiorites called for the federal government to build a stockade at the Head of the Lakes to protect its pioneers. In 1854 a group of 19 U.S. senators, congressmen, investment bankers and lawyers known as the “Proprietors of Superior” founded the community at the western end of Lake Superior as a planned city born out of both political aspirations and financial speculation. Senator Stephen A. Douglas, a vigorous proponent of western expansion, spearheaded the effort. The Proprietors planned to establish a lake-and-rail transportation hub that would become operational when the Sault St. Marie locks opened Lake Superior to shipping traffic from the other Great Lakes and the Northern Pacific Railroad created a railway from Lake Superior to Washington’s Puget Sound. With this promised infrastructure and potential of vast natural resources, speculators flocked to this newly platted city of destiny. Early estimates put the population at up to 3,000 residents, numbers that fell sharply with the nation’s financial panic of 1857, causing most of Superior’s fortune seekers to flee the remote wilderness settlement. In 1860 Superior’s population settled along the bay from the Nemadji River to roughly what is now 4th Avenue East and several blocks back from the shore. The first Douglas County Census that same year recorded 771 Superior residents. This number included settlers from the East, European immigrants, local Ojibwe, and those of “mixed blood,” parentage—children of European and native descent. While some of the Ojibwe population lived within the town proper, their largest concentration lived on Wisconsin Point. The local Ojibwe were friends to the town’s settlers, living and working among them. Superior was remote. Its nearest neighboring town was Bayfield, 8o miles east along the Lake Superior shore, and after that Chippewa Falls and St. Croix Falls, hundreds of miles away. With the exception of a handful of loggers and fur traders, Minnesota was relatively undeveloped north of St. Paul (townships in what is now Duluth were first established in 1856-1857, most established by Superior residents). Superior historian Robert E. Armour wrote that, “All this area was, for practical purposes, in control of the [Ojibwe] and could further isolate Superior at any time.” The Civil War took a further toll on local populations, as many unemployed men went to fight for the Union. In August, 1862, New Ulm, Minnesota, experienced an uprising by the local Sioux, the largest such attack on a community since 1776. Rumors and inaccurate reporting claimed that 800 settlers had died, which caused fear and panic among Superior’s remaining residents. To throw fuel on the fire, the city’s newspaper, The Chronicle, had a history of sensationalizing its stories of Indian activity reported from territories further west. According to Superior Historian Ron Mershart, the newspaper often repeated two kinds of stories about Indians: those with harrowing details of uprisings, and those of frightening tales of the abduction of women and children. The usual quiet of our town has been quite disturbed of late by fears of an attack from hostile Indians. Numerous rumors of the appearance and strange conduct of Indians have been about in our streets and many of our citizens have been thrown in a state of excitement. At a public meeting last week, a Committee of Safety was appointed and matters concerned with our security committed to their charge. An agent, Mr. E. C. Clarke, was dispatched to Madison to procure arms and apply for assistance in making defense.”Men who did not enlist in the Union Army assembled to form a “Home Guard.” As their first official act, the Safety Committee issued orders for the guards to keep watch daily from 9 p.m. to 5 a.m. Families were asked to sleep in a designated area between St. Johns Ave. (now 19th Ave. East) and Thompson Ave. (today’s 23rd Ave. East) between 4th Street and the bay. The group prohibited sales or provision of ammunition and alcohol to local Ojibwe. The committee considered fortifying the town’s pier and a large warehouse to use as a safe shelter in the event of attack or building a stockade. When their first meeting ended, they had a draft of a letter to the governor of Wisconsin asking for troops at Superior. Armour’s research found no expenditures for either the fortification of the pier or the building of a stockade, but he did discover that “Mr. Clarke returned two weeks later with 200 rifles and 5,000 cartridges, but no cannon.” This account conflicts with that of Gerald C. Stowe, a curator at the Douglas County Historical Museum, who wrote that Clarke returned with the promise of arms, but a full month passed before 192 musket rifles and 5,000 cartridges arrived by steamer. The stockade was one city block wide, between Walbridge Avenue (17th Ave. East) and Carlton Avenue (18th Ave. East) and from Third Street to the Bay, which was a distance of over two blocks. 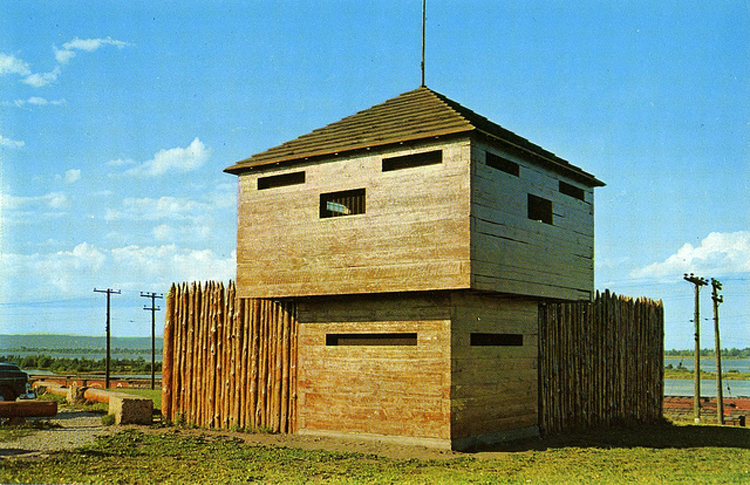 A solid palisade was constructed around the area, being 12 feet above the ground and pointed at the top end. Two block houses were built at each inside corner of the stockade. Inside the stockade, a community building, forty by sixty feet, was built. The federal troops’ didn’t stay in Superior for long. By August 1863, all but a few had left—the nation was at war, and they were needed elsewhere. The stockade stood for several more years, but eventually the residents of Superior tore it down and used its lumber as firewood.